If that’s true, are you one to follow the herd, or are you one to be a contrarian investor? A contrarian investor is known for making investment decisions that sometimes run counter to the prevailing wisdom and thinking. Contrarian investing may have received a boost in popularity due to movies like “The Big Short” where a small group of individuals correctly predicted the downfall of the mortgage derivatives market in 2008. This movie correctly depicted the difficulty of publicly making statements to investors that was definitely not the prevailing sentiment at the time. For those of us that dabble in the crypto market, this sort of interaction is quite a bit more common than in traditional investing. You don’t have to go far in online to find many different viewpoints about the topic of the day in crypto. Setting aside the active discussions that happen on various topics, however, when we look at the money flows and the investment choices made by individual traders on a day-to-day basis, we see a preponderance of herd behavior and price increases and declines. 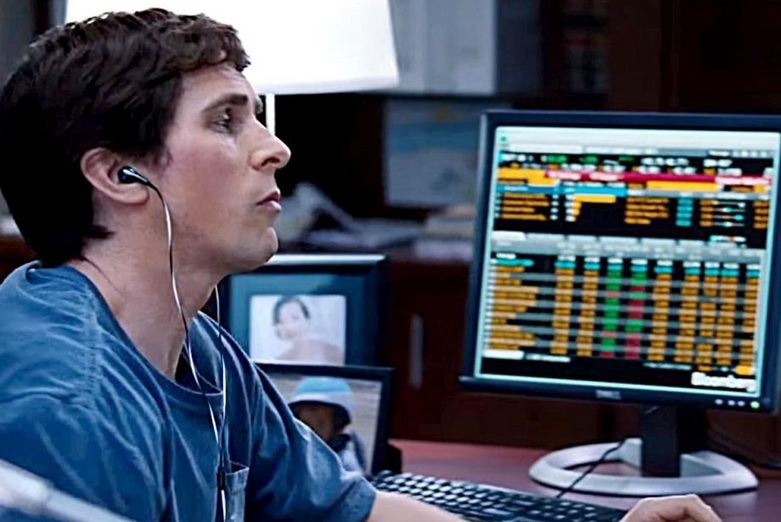 When I think of the type of contrarian investor depicted in the movie “The Big Short” I think of investors that have carefully analyzed crypto choices and made a decision on where to invest their money based on hard evidence and traditional business principles. To truly understand the difference between technical analysis and fundamental analysis, we should consider its more popular cousin; technical analysis. Technical analysis dwells on historical data that revolves around chronological recording of market price of an asset; it could be a stock price, a commodity, or in our case, a digital asset for sale on an exchange. This type of analysis looks at patterns with the goal of determining future price behavior. When an individual performs technical analysis of a stock or any other asset, they are looking for trends and trading behavior that might point to a future price point. In some cases, the time frame of a technical analyst is days, but in other cases it could be hours or minutes. The principles and patterns tend to be the same, but intangible properties can also be mixed into the variables that are correlated with price movements. In some cases, out-of-the-box observations may add key variables to any statistical equation that seeks to demonstrate correlations. For example, the weather, or day of the week, or even time during the day could all be correlated to certain price behaviors. Despite its principles being grounded firmly in mathematics, the outcomes of any technical analysis seem to differ greatly depending on who is performing the analysis. While some analysts will provide observations, others will provide intuitive guidance with very specific price points for support and resistance. It’s this later category of individual that intrigues me – I’ve noticed that some individuals are able to take the existing tool-set available for technical analysis and create a holistic picture of a situation that will ring true for hours at a time. Everybody knows somebody that can do this – whether in a forum or personally. This observation is curious, as the entire market is waiting for the moment when legacy Bitcoin finally gives way from a market share perspective to its more capable and modern crypto brethren like the XRP Ledger. If XRP is leading the market, it may indicate that the sentiment of investors is starting to shift. While technical analysis looks at price behavior and data points, fundamental analysis looks at the tangible, measurable aspects of the business underlying the asset. Fundamental analysis matters incrementally more if there is an organization that is underpinning the value of the asset being traded. For example, if you’re dealing with commodities, it wouldn’t make much sense to look at specific companies, unless you felt that there is one or more that might be able to impact the market in a larger sense. But not so for stocks or assets issued from a company. For those assets issued or created by a company (or championed by one in the case of XRP and Ripple), it’s important to look beyond the current and recent price history of the asset itself and look instead to the short-and-long term plans of the company. Accountants use ratios, balance sheet summations, and overall business measurements to conduct a fundamental analysis of a company when associated with an audit. Likewise, these numbers are also used by financial analysts that are looking at a company’s books for the purpose of determining whether the business is worthy of investment. What are these fundamental numbers? A business with strong fundamentals indicates that the business is not only a going concern, but is probably working with a viable business framework or structure, and is poised for success. Buy and hold: The idea is to latch onto a good business that allows the asset to grow with the business. Fundamental analysis is used to find “good” companies. Value investing: The idea is to identify under-valued companies. Contrarian investing: Herd behavior of the market is ignored and the investor just looks at the facts. Looking at these categories, which one are you? How did you hear about XRP? Was it from a friend, or did you conduct research on your own before making an investment decision? I started out as a combination of being a ‘buy and hold’ type of investor, and then when challenged by Bitcoin maximalists and crypto-anarchists, I became a ‘contrarian’ investor. No matter the label, fundamental analysis helps eliminate the emotion from investing and look at the facts of the market and the asset. I will not make the argument that the market has evolved beyond its beginning far enough to reward the most innovative crypto networks with the majority of investment money. In fact, I consider Bitcoin’s continued positioning at the #1 spot on the coin listings to be an anomaly that will be rectified at some point in 2018. Despite what I'd like to see, there is currently a majority of momentum behind technical analysis that is hard to ignore; the behavior of crypto investing much more strongly resembles herd behavior than a rational choosing of investment options by well-informed individuals. 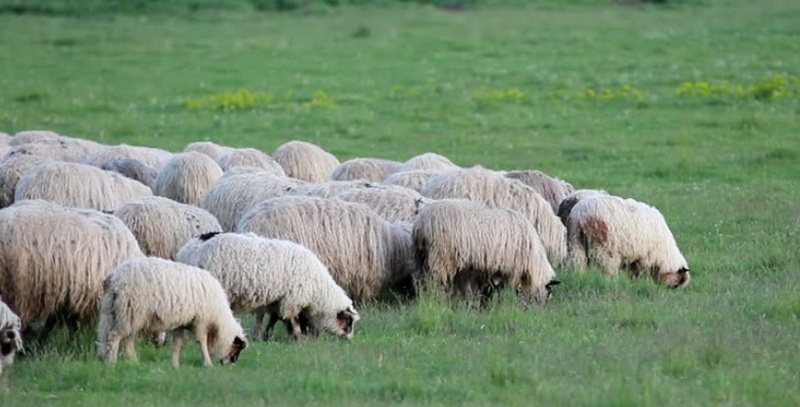 Is Herd Behavior Unavoidable in Crypto? No matter how much any of us rails against the dominance of technical analysis the current prevailing herd behavior of crypto investing, it may not make much of a difference because of the inherent technical complexity associated with the topic. Even when it came to the Internet, there was a minimum bar of understanding for most people to reach before they were even comfortable using the Internet. Likewise, if we look at crypto, is it reasonable to expect that “Uncle Joe” will be able to understand why the smart contract capability of Codius is superior to that in Ethereum? No, it’s not. In fact, Uncle Joe will most likely just base his understanding on “Nephew Walter” who actually understands and follows these topics on online forums such as Reddit. If the entire topic of blockchain technology is too complex for ordinary people to grasp, then the fallback for most of us is that same herd behavior that I’m disparaging; it’s the tendency for people to ask their neighbors about something if they don’t understand it themselves. Or worse yet, they just fly completely blind, and don’t understand the difference between truth and lies when they see something on Twitter or YouTube. Hence we still see herd behavior prevailing in the crypto market. How can we change this? SBI recently published a list of businesses that they plan on starting – and all of them are related to blockchain technology and businesses. In addition, one of the businesses’ purpose is to provide ratings of cryptocurrencies and digital assets. 8 There is a strong demand for this type of service from financial companies – to provide investment guidance on complex technical topics like digital assets. What Is Fundamental Analysis For Digital Assets? To truly understand the asset that you’re purchasing, it’s important to conduct your own financial analysis. Often in online forums, I use the term DYOR. It’s an acronym that stands for Do Your Own Research. I say it to remind readers that I’m just a random investor like they are, and that the only difference is that I do my own fundamental analysis of cryptocurrency choices prior to purchasing any material amount for an investment. While I trust my own skills, I am not a trained financial analyst and I’m definitely not a specialist in cryptography. So what do I look at when I consider a cryptocurrency for an investment? One of the first factors to consider when evaluating whether a crypto investment is worthy of your hard-earned money is the sponsoring organization. Is it a nonprofit foundation, like many of the organizations that are formed to champion adoption? Or is it a business whose sole purpose is to promote the adoption of its underlying digital asset? These factors make a difference, so it’s important to include it as part of your evaluation criteria. Other factors to consider have to do with the technology and the digital asset itself. For further research, I advise individuals to evaluate performance criteria for the cryptocurrency that they’re investigating. Performance criteria has to do with how the digital asset responds under stress. For example, how many transactions per second can the digital asset process? How fast can it settle just one transaction under optimum conditions? These metrics target the performance criteria that real businesses will need if they plan on actually using the digital asset in a production setting. An important performance criteria to consider when it comes to digital assets is scalability. If the network is not used heavily, then it will most likely respond with speed to any sample transaction; but what about when the number of transactions increase to a level that is like what one would expect in a production application? 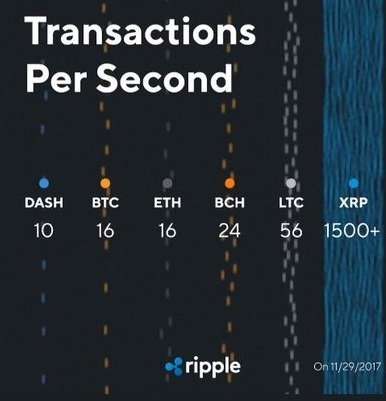 This graphic targets the ‘on-chain’ speed of XRP compared to some other popular crypto choices. From it, you can deduce which network is most prepared to quickly support global levels of transactions and which networks would most likely encounter significant issues in processing. Proponents of these other, lesser networks will most likely point you to a concept that quotes ‘off-chain’ speeds and allows other applications to keep a channel open to each crypto network while off-chain transactions are processed at extremely high speeds. This concept utilizes the concept of summarizing the effect of multiple transactions and then communicating just one summary transaction to the actual crypto network. The benefit to off-chain transactions is the speed; the downside to off-chain transactions is the inherent centralization of the overlaid software, along with the fact that individual transactions are now stored off-ledger – they are stored (hopefully) by whatever third party is utilizing those off-chain transactions. So the benefits of decentralization and recording a transaction on an immutable ledger are both lost, but what is gained is the ability to scale to even higher levels of transaction processing. Have you sent Bitcoin to an exchange? Why six confirmations? Because in a blockchain, you never really achieve 100% certainty that your transaction went through. Even if it’s included in six blocks, it could still technically be reversed; however, being confirmed by six consecutive blocks reduces the likelihood of this happening to a very low number. The above graphic provides a stark visual depiction of how much XRP's performance metrics are currently dominating the crypto market. Speed and scalability have long been a strong central characteristic of the XRP Ledger. In addition to scalability and settlement speed, are there other fundamental criteria that you should be researching for each cryptographic network? How big is the sponsoring organization? Where in the world is the sponsoring organization located? What are the business plans of the sponsoring organization? What is the biggest use case for the digital asset? How much are the transaction fees on the network? Is it a permissionless network? Was the digital asset created to solve a problem, or is it in search of a problem? How stable is the network? Has it had any downtime? How decentralized is the network? How many units are outstanding for the digital asset? How secure is the network – what is the quality of their cryptography / code? How much daily volume is on the crypto network? Is the organization that created the digital asset trust-worthy? How much competition exists for the asset? This list is my own potpourri of different aspects of a cryptocurrency or digital asset; when you conduct your own research, it’s important to create a list of factors that make a difference to you personally. Perhaps you’re more concerned about the development team. In that case, it should be a heavily-weighted factor in your own personal analysis. The takeaway here is simple: You need to create your own personalized list of fundamental factors, even if it's just a list in your head. Fundamental analysis is starting to make inroads into the crypto universe. We’ve seen ratings agencies eyeing our space, salivating at the thought of new investors wanting advice about crypto choices. While these ratings services may eventually catch up to the amount of rigor that individuals can apply to investment choices, I do not have high expectations. While official ratings from ratings agencies may be one data point for you to look at, from what I’ve seen, you should approach these services with a healthy dose of skepticism. In addition to gaps in knowledge regarding crypto topics, there may be other factors at work as well – such as the concept known as ‘pay-to-play’. This is a disreputable part of the crypto universe at present – the preponderance of conflicts of interest. I don’t have any specific examples, but if an ICO ratings service accepts money from the same ICOs that they’re rating, then you should discount their opinions on that topic – it’s important to seek out independent opinions on your research topics. You should verify all sources, and also look at alternative opinions and research. Fundamental analysis is useful for identifying when an asset or potential investment is undervalued by the larger market. If the larger market – like the crypto market – is currently ruled by investment flows resembling herd behavior, then just wait; eventually the market corrects itself in dramatic fashion when the facts start to make themselves known. We’ve seen this on multiple occasions with XRP, where the crypto market suddenly wakes up and realizes that the promised potential of digital assets is close to being realized by one of their own – XRP. 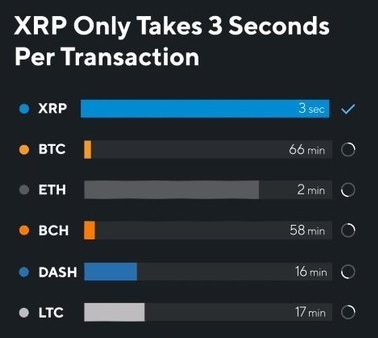 XRP’s performance metrics dwarf those of other existing, top-level choices in cryptocurrency. These competing digital assets do not stand up to the scrutiny of fundamental analysis. Yes, there are other crypto networks and digital assets. But can any of them boast a company as large as Ripple as their primary sponsoring organization? None that I’m aware of. Do any of them come close to XRP’s scalability? No. How about settlement speed? No. 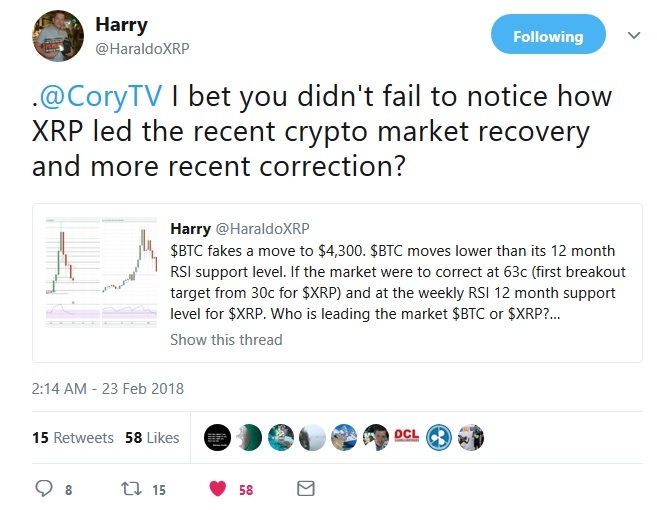 Essentially, XRP shines like the sun under the microscope of fundamental analysis. 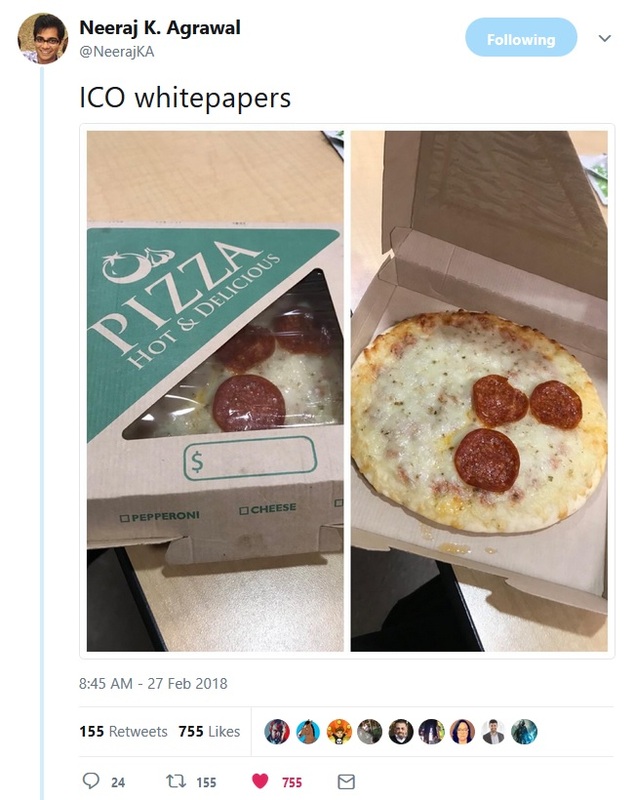 It’s a funny meme in the making, and it serves to illustrate a point: ICOs and other coin offerings are now very adept at creating all the trappings of a legitimate enterprise… except for the business results. The irony to me is that it takes great skill and effort to so eloquently fool all the analysis capabilities of some of the current crypto market participants – the current demographic is very heavily weighted towards the young IT professional, and this is the very demographic group that should know and understand how easy it is to set up a legitimate-looking website with all of the trappings. If these same scammers put that much energy into a legitimate enterprise, they could probably make much more money legally. They must do it because the return on their investment is enough to reward them for this criminal behavior. Unfortunately, we see occasion after occasion of individual crypto investors throwing their hard-earned XRP or dollars at these ICO sites. The key takeaway here is to not trust the public-facing collateral for these ICOs and coins. You need to dig into the topics, and talk to as many different people on as many different platforms as you can. Don’t depend on just one social media platform to give you the whole perspective; survey people on Twitter, Reddit, Quora, and Discord. Don’t stop there. Look at Wikipedia. Look at Facebook. Instagram. Look at all available sources including news articles. Then take the time to evaluate all of the pertinent details about your investment choices. I’m an XRP investor. I’m also a strong believer in Ripple’s short-and-long-term business plans. I also own XRP. Given all of that information provided as part of my usual full disclosure to readers, you should be asking yourself the question “Why is this author encouraging me to perform fundamental analysis? How does it benefit him?” And that’s a good question to ask. I am advising readers do their own research and conduct their own fundamental analysis for one simple reason: I know where this path will lead you.